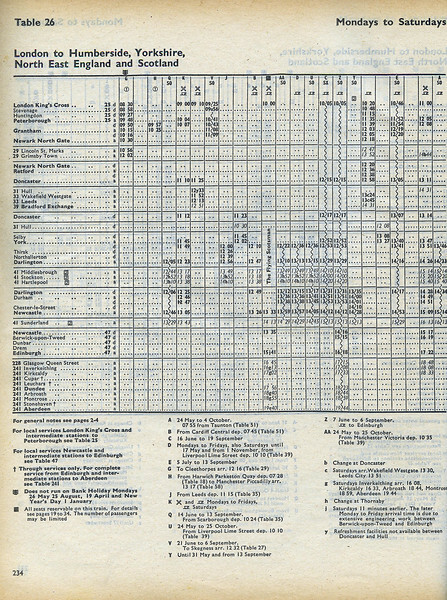 Table 26 is the ECML and I've featured the page with the premier train, the 10:00 Kings Cross to Edinburgh Flying Scotsman, which in 1975 would have been a class 55 on Mark 2 air-conditioned stock plus a Mark 1 restaurant car and a Mark 1 full brake. According to the footnote the schedule on weekdays was 11 minutes slower than on Saturday on account of engineering work between Berwick and Edinburgh, possibly related to increasing clearances for containers (which was one of the causes of the Penmanshiel Tunnel collapse a year or two later). Five minutes behind the Flying Scotsman came, what in LNER days was called the Junior Scotsman, which by 1975 only ran all the way through to Edinburgh on Saturdays, on Monday to Friday it terminated at Newcastle.